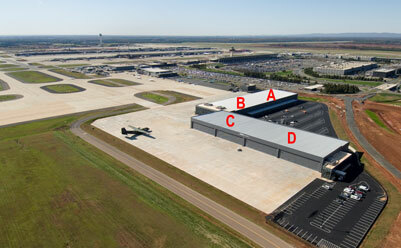 A highly secure facility, Dulles Jet Center was designed with the protection and safety of your corporate jet in mind. Each spacious hangar can accommodate your jet without crowding, and our leasing policies reinforce this to assure ample room and ease of access. 300,000 feet of ramp parking is conveniently accessible to all runways, giving you unmatched ease of movement and safety for your plane. and storage rooms are available.